If you’re a frequent BART rider, chances are you’ve been in a situation where you need to exit a station shortly after entering it. Maybe you heard an announcement that BART is experiencing systemwide delays and you need to find another means of transportation. Maybe you just missed a train late at night, and instead of waiting 20 minutes, you decide to catch an Uber. Or maybe you forgot something at your home/work/car/etc. and need to run back out of the station to fetch the item. If this has happened to you, chances are you’ve been hit by BART’s Excursion Fare. Why does the Excursion Fare exist? According to a 2010 interview with then BART spokesman Linton Johnson, the fare was developed when BART first opened in 1972 – a time when people would tour the system for the novelty of the experience. Forty-five years later, the Excursion Fare has strangely persisted; only these days, nearly all Excursion Fares are collected from everyday riders, as opposed to novelty seekers. Charging a triple premium fare to not use a service is without precedent amongst BART’s peer agencies. BART’s Excursion Fare ridership is small, but by no means trivial. In October 2017, Excursion Fares accounted for approximately 1,600 weekday boardings, or 0.37 percent of average ridership. [i] While a small percentage, Excursion Fares make up almost as many riders as the Oakland Airport Connector. On weekends when service is less frequent, Excursion Fares are double that of weekdays, totaling 0.73 percent of ridership (about 1,100 boardings). This total is higher than weekend boardings at six BART stations. The share of Excursion fares has stayed relatively constant over the past 15 years despite BART’s passive encouragement of riders to avoid such fares by consulting a station agent. On an annual basis, revenues from Excursion Fares add up. BART had an estimated 584,000 Excurison Fare trips last year. Assuming each passenger pays a full fare of $5.75, BART earned approximately $3.4 million off of such trips. 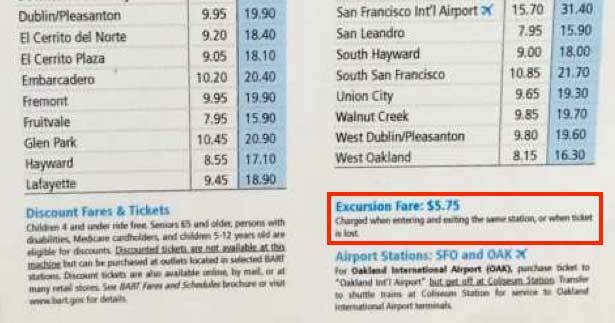 It is no wonder why the Excursion Fare has survived over four decades – it makes BART a lot of easy money. There is no good reason why Excursion Fares should exist: they are unfair, dishonest, inequitable, poorly communicated, and often prompted by BART’s own shortcomings and delays. A product that exists solely to make money from mistakes and misinformation is not a public service; it is a scam. BART needs to ditch Excursion Fares once and for all. [i] BART’s ridership data excludes instances in which a station agent waived an excursion fare. Simply allowing a passenger to exit the same station with no fare if the exit is within fifteen minutes of entry would solve the problem. You could still have the excursion fare, although any tourist with a local friend would leave at the next station if they were downtown (where the stations are close to each other). Even with the excursion fare it is cheaper than the cable car!